Edsel Strong is the son of Albert M. Strong and Nobie M. Bagwell. Albert Strong is the son of Albert M. Strong and Nobie M. Bagwell. Elisha D. Strong was born in May 1858 in Alabama. Mary Elizabeth Lorenz was born on 25 December 1905. She married Garry Falson Bagwell, son of John William Bagwell and Sarah Ellen Carr, after 1920. As of after 1920,her married name was Bagwell. Mary Elizabeth Lorenz died on 6 November 1992 at age 86. She was buried on 9 November 1992 at Memorial Park Cemetery, Kokomo, Howard County, Indiana. Garry Bagwell was born on 5 September 1925. He was the son of Garry Falson Bagwell and Mary Elizabeth Lorenz. Was in the United States Navy. Garry Bagwell married Pat (?) after 1945. Garry Bagwell died on 15 September 1988 at age 63. He was buried at Memorial Park Cemetery, Kokomo, Howard County, Indiana. Ernest L. Gerhart was born in 1887. He married Nila O. Bagwell, daughter of John William Bagwell and Sarah Ellen Carr, after 1900.1 Ernest L. Gerhart died on 19 August 1957. He was buried at Greenlawn Cemetery, Greentown, Howard County, Indiana. Edith L. Lawson was born on 15 May 1907. She married Paul L. Bagwell, son of Carl Russell Bagwell and Nora King, after 1917.1 As of after 1917,her married name was Bagwell. Edith L. Lawson died on 9 June 1991 at age 84. She was buried on 13 June 1991 at Greenlawn Cemetery, Greentown, Howard County, Indiana. 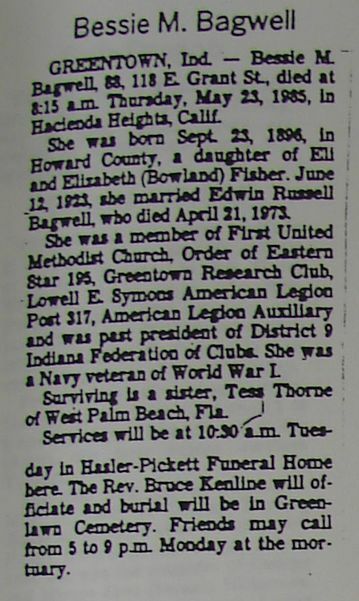 Her married name was Ruth Irene Bagwell. Ruth Irene Kilander was born on 18 September 1897.1 She was the daughter of Frances Kilander and Lettie Ellen Younce.1 Ruth Irene Kilander married William Merrill Bagwell, son of Milton Archabold Bagwell and Dora Belle Olwin, on 16 September 1922.1 Owned Bagwell Coal Company and Speedwash Coin Laundry.1 Ruth Irene Kilander died on 16 September 1990 in St. John's Medical Center, Anderson, Madison County, Indiana, at age 92.1 She was buried on 21 September 1990 at Greenlawn Cemetery, Howard County, Indiana. Tamara Bagwell is the daughter of Edwin Doyle Bagwell and Mary Louise Batey.1 Tamara Bagwell married Dennis Arnett after 1950. Dennis Arnett married Tamara Bagwell, daughter of Edwin Doyle Bagwell and Mary Louise Batey, after 1950. Tess Fisher was born circa 1900. She was the daughter of Eli Fisher and Elizabeth Bowland. Roger Mosser married Nancy Kay Bagwell, daughter of Delbert Ray Bagwell and Annie Belle Cohee, on 27 February 1954 at Indianapolis, Marion County, Indiana. Irvin Trowbridge was born on 6 July 1918 in Kansas City, Missouri. He married Joan Bagwell, daughter of Delbert Ray Bagwell and Annie Belle Cohee, on 15 June 1946 at Indianapolis, Marion County, Indiana. Irvin Trowbridge died on 10 February 1986 in San Diego, California, at age 67. He was buried at Alta Mesa Cemetery, Palo Alto, Santa Clara County, California. Harry Roland Plotner was born on 14 May 1919 in Miami County, Indiana. 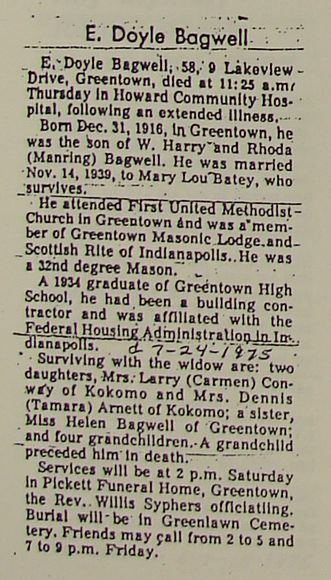 He married Doris Aggeleze Bagwell, daughter of Delbert Ray Bagwell and Annie Belle Cohee, on 24 April 1948 at Greentown, Howard County, Indiana. Harry Roland Plotner died on 27 December 1993 at age 74. Bonnie G. Bagwell, 97, Greentown, passed away at 12:36 am Sunday, January 13, 2019, at Community Howard Regional Health in Kokomo. She was born December 1, 1921, in Kokomo, the daughter of the late Otis & Grace (Oyler) Redinbaugh. On March 24, 1940, she married Blaine Bagwell, who preceded her in death on March 31, 2012. Bonnie retired from Delco Electronics after 21 years of service in 1986. She was a member of New Life Church. Bonnie is survived by her children, Brent Bagwell, Winnie, TX, Belinda (Richard) Sezbenski, Kokomo, Benita (Stan) Zirkle, Greentown, Beth Jaenicke, Greentown, Brad (Janine) Bagwell, Kokomo, and Bart (Lisa) Bagwell, Baytown, TX; grandchildren, Eric Bagwell, Winnie, TX, Kurt Bagwell, Fallon, NV, Kelly (Kevin) Toups, Winnie, TX, J. Blaine Bagwell, Winnie, TX, Erica Bagwell, Mexico, Bryce (Cynthia) Higgins, Indianapolis, Heath Higgins, Palm Harbor, FL, Lori (Todd) Arnold, Ryan (Kristi) Zirkle, Greentown, Trisha Pironello, Kokomo, Jessica (Andrew) Withers, Charlotte, NC, Rebekah (Jeremy) Hill, Ft. Wayne, IN, Chris (Roxanne) Bagwell, Mount Juliet, TN, Erin Bagwell, Kokomo, Joseph (Allyson) Parker, Kokomo, Andrew (Kelly) Bagwell, Battlefield, MO, James (Courtney) Bagwell, Springfield, MO, Timothy (Mirva) Bagwell, Kerava, Finland, Philip Bagwell, Madrid, Spain, and Elizabeth Bagwell, Baytown, TX; great-grandchildren, Bianca Bagwell, Amy Hamilton, Kearston Wiesse, Wasey Wiesse, Kylor Wiesse, Michayla Wiesse, Ashley Bagwell, Zach Bagwell, Brittanie Bagwell, Lily Bagwell, Morgan Wideman, Nic Arnold, Elliot Arnold, Conner Zirkle, Gwyneth Zirkle, Emerson Pironello, Giada Pironello, Brianna Bagwell, Samantha Bagwell, Brody Bagwell, Clay Bagwell, Cole Bagwell, Alexandria Bagwell, Elijah Bagwell, Stella Withers, Harper Withers, Quinten Hill, Michael Sipes, Kennedy Sipes, Dom Belcher, Andrew Parker, Maxwell Davis, and Jolie Wiesse; and cousin, Mary Flora, Kokomo. Bonnie was preceded in death by her parents; husband; children, Brenda Bagwell, and Bryce Bagwell; brother, James Redinbaugh; and grandchildren, Jeremy Bagwell, Jennifer Bagwell, and Alice Bagwell. Funeral services will be held at 10:30 am Thursday January 17, 2019, at Hasler & Stout Funeral Home, 112 East Main Street, Greentown, with Pastor Randy Blankenship officiating. Burial will follow in Greenlawn Cemetery, Greentown. She was buried at Greenlawn Cemetery, Greentown, Howard County, Indiana.